Note 2008: Most astrologers have a preferred house method (or methods) and many are willing to express a strong opinion on the matter, regardless of whether they understand the issues involved. One such was this writer who, like many others, eventually settled on Campanus as the only 'logical' quadrant system, a notion that would endure for some years and one that was not easily shaken off. Further study proved this 'logic' both superficial and flawed but it also raised a rather simple question: - does a given method do what its inventor (or proponent) says it does and does it reflect astrological principle? Overall, most do not and we have now dispensed with methods that defy astronomical fact, astrological principle and common sense. We have also seen that to borrow the North/South meridian from the semi-arc system and thereafter divide a fictitious Right sphere defies all three. But lest any doubt remain, we will rehearse the implications of this via the original choice - Campanus - which demonstrates the nature of the problem as well as any other. It will also demonstrate that this paper is no partisan exercise. Western astrological practice has developed in - and for - the temperate and tropical regions of our world and it is not a purpose of this series to foist those practices upon the peoples of the Polar Regions. Rather, the intention has been to embrace the higher latitudes in order to explain, navigate and test the coherence, or otherwise, of a number of horoscopic theories. We have seen that when this or that method of house division fails to survive circumpolar application, that failure is but a symptom of some other theoretical flaw or practical shortcoming that passed unnoticed - or was perhaps simply ignored - at lower temperate and tropical latitudes. This is certainly the case with the majority of methods discussed in these pages. We must be careful though to distinguish between methods that incur total collapse and those that suffer only limited and hypothetical failure. Of the latter we must recognise that, due to the theoretical absence of compass directions, all quadrant methods fail at the exact North and South Poles and that all Equal divisions fail once a day at the Polar Circles, due to the split-second conjunction of the Ecliptic and horizon circles. Yet such lacunae are irrelevant in practice as each require infinitesimal measurement of time and/or space. These lacunae are also reminiscent of the blind spot in the eye, where it connects to the optic nerve. This connection is a necessary symptom of our visual apparatus, taken as a whole, and the same may be said of the trigonometric 'blind spots' found in horoscopy. There is then a third category of quadrant methods, which includes Koch, Alcabitius, Porphyry, Natural Graduation and other variations of Porphyry. These all fail at the Poles, for the same reasons as other quadrant divisions, but also at the Polar Circles, for the same reasons as the Equal divisions. In this category such failures are symptomatic of total collapse. Perhaps the most surprising general failure is that of Regiomontanus, though its circumpolar collapse is less obvious than those of the third category. This collapse is certainly less spectacular than those of the Koch or Topocentric systems, both of which hide considerable inconsistencies 'beneath the bonnet' of a drawn chartwheel. None of the aforementioned methods are suitable for global application and all may be rightly condemned for their theoretical and practical flaws. The Meridian (or East Point or Axial) system cannot by its own definition be applied globally because it resets all charts to the Equator, having no regard for the real Ascendant or local skies. The same is true of the method conceived by Morin de Villefranche ('Morinus'). In terms of global application, mathematical consistency, spatial equality and coherence, we are left with only the Equal divisions and the quadrant methods of Campanus and Placidus. Given that no method - including all those rejected above - can always produce circumpolar horoscopes that duplicate all features found in temperate and tropical charts, we must turn to other considerations. - Like most quadrant systems, Campanus is really two methods in one. Its 4th and 10th cusps (and arguably its 1st and 7th) are obtained from semi-arc principle, as we have seen. While its intermediate cusps do seem exclusively Campanian, the east/west orientation of that from which they are derived - the Prime Vertical - is established in the first place via compass directions that are also generated by semi-arc principle. Without this orientation, the Campanian carapace might point in any geographic direction. - Campanus can be used in the Polar Regions because it retains the same structural form, regardless of geographic latitude. Such rigid adherence to structure ensures that the houses are always of equal size but it also prevents the method from taking account of the nature of the local skies. i) Whenever the Ascendant is in reverse, Campanus gives a 10th house cusp/MC in a degree that is at lower - not upper - culmination. This contradiction is by no means the first or only example of a horoscopic theory ensuring that trigonometric expediency triumphs over astrological principle. In this instance it is important that we distinguish between 10th house qualities, represented by upper culmination, and 4th house qualities (e.g. - the end of the matter or the seed of new beginnings), as represented by lower culmination. In temperate and tropical horoscopes, where the entire zodiac passes over all four horoscopic angles in approximately 24 hours, these qualities can be represented, unambiguously, by the MC and the IC. But this is not always the case at higher latitudes where, in accordance with seasonal considerations, parts of the Ecliptic unable to rise or set continue nonetheless to pass through upper and lower culminations (see Polar Meridians). Both Campanus and Placidus adhere to the principle that celestial space allotted to the 10th house is entirely above the horizon. But when a circumpolar Ascendant is in reverse, the upper culmination of other Ecliptic degrees always occurs below (the South Point of) that horizon. Placidus reconciles this by recognising the degree at upper culmination while omitting any reference to a 10th cusp. (This is astronomically correct since no part of the Ecliptic ever passes through 10th house space - under either method - while the Ascendant is in reverse.) In taking no account of local skies, Campanus has in these circumstances no choice but to reverse the usual attributes of upper and lower culmination, associating the former with its 4th house and the latter with its 10th. ii) As with Regiomontanus, planets or stars rarely occupy successive Campanus houses for equal periods of time. Such diurnal inequalities might be evened out, more or less, over one or more annual cycles, at or near the Equator, but this is not the case at higher latitudes. In extreme examples, annual cycles can accord little recompense where planets tenant some houses for several hours and other houses for but a few minutes. Temporal considerations such as this are often deemed irrelevant to Campanus because of the supposition that it is a spatial/static division; but this in no way alters the fact that, overall, planets are more likely to be posited in the same few houses of the horoscope and are far less often found in others. This inequality is hardly confined to circumpolar horoscopes. It is clearly in evidence at such diverse locations as the Highlands of Scotland, Tierra del Fuego, South Alaska, Scandinavia and South Georgia. iii) The Sun rises daily in temperate and tropical climes, passing thereafter through each of the twelve houses, once and in reverse order, before rising again. The same pattern is evident in the Polar Regions during their Spring and Autumn periods when the Sun rises and sets on a daily basis. But when the Sun cannot set, it remains permanently above the circumpolar horizon, passing through only six houses in 24 hours (houses 7 - 12 that are also permanently above the horizon). This much is true of both Campanus and Placidus. The difference between them lies in the order in which the circumpolar Sun traverses their respective houses. Under Placidus, the temperate or tropical pattern is followed, with the Sun passing through these six houses once every 24 hours and in reverse order. Following lower culmination the sequence is 12, 11, 10, 9, 8, 7 and then back into the 12th, where the cycle recommences. This sequence cannot occur under Campanus. In the example given in Polar Meridians (Diagrams 1 and 2), the Sun, following lower culmination, passes through Campanus houses as follows: - 10, 11, 12, 11, 10, 9, 8, 7, 8, 9 and then back into the 10th. In the Polar Regions, Campanus cannot yield the orderly reverse sequence common to both methods in temperate and tropical latitudes. This latter feature, though possibly of lesser consequence than the other shortcomings, is surely the result of accident rather than design. The same must surely be true of the temporary reversals of associations between the 10th/4th houses and upper/lower culminations. One may add with certainty that all are due to the fact that this method, which purports to effect the 12-fold division of a static and imaginary sphere, must by definition ignore the variable nature of different local skies. The paradox here is that it is the motion of the local sky that produces the compass directions that provide Campanus with both its orientation and its MC. i) Many texts on house division describe the various methods in terms of their trigonometry alone, with scant regard for any rational or philosophical ideas that might underlie any particular system. As such, the subject of domification - already found difficult by many - became utterly opaque to all but those comfortable with mathematics (or to those with an imaginative mind's eye). Together with the fact that computers and the Internet have largely replaced logarithms or programmable calculators as the practitioners' calculating tool of choice, otherwise able-minded astrologers have been all but denied the fundamentals of horoscopy and domification. The local horizon: by definition a great circle. The Meridian: which is generated by Earth's rotation of the local horizon (and is therefore quite incidentally a great circle). The Ecliptic: a great circle created independently of Earth's rotation. Revolution: The Ecliptic is generated by Earth's annual revolution of the Sun. Rotation: The Angles (and houses/cusps) are generated by Earth's daily rotation. Any other quadrant method must, in order to obtain its intermediate cusps, add a third factor to this temporal arrangement; to wit, the trigonometric structure that most appeals to its inventor. It is doubtful that such an addition would have appealed to Bishop Occam. We saw in Polar Meridians that horoscopes - over time - demonstrate the link between daily rotation and annual revolution. Their division of the daily cycle and the geographical direction of the Ascendant reflect local seasonal (i.e. annual) variations, peculiar to the geographic latitude for which the horoscope is cast. Any further link between them depends on which type of Zodiac is favoured: Tropical or Sidereal. The Sidereal Zodiac, traced out by Earth's annual revolution and no other factor, presents practical difficulties because its fiducial point remains in dispute. Yet even this uncertainty does not challenge its theoretical value, nor its annual cyclical basis. The Tropical Zodiac, in contrast, is not a solely annual phenomenon, precisely because of its clear fiducial. The starting point of the Tropical 0 Aries is the Equator, which is generated by the Earth's rotation and not by its annual revolution of the Sun. While the semi-arc system is based on rotation, so in part is the Tropical Zodiac  and this should be borne in mind as we conclude. The Equal divisions can claim this quality, though not without condition. As we saw at the beginning of part 1 of this paper, Equal Houses may be deemed 'static' only if their conceptual basis will allow custody of the 1st house cusp to cross from eastern to western horizon when the circumpolar Ascendant is in reverse. Rigid adherence to the ascending degree, regardless of whether it is rising directly or in reverse, recognises that the principle of daily rotation underpins the method, meaning that it too cannot be considered 'static.' The same reasoning applies to Sign/House. We could likewise argue that no Equal method could rightly be deemed 'static' if used in conjunction with the Tropical Zodiac, because the latter's fiducial is also created by rotation. It seems that only two methods of house division retain their theoretical integrity while at once offering world-wide use: Placidus and Sign/house. Any other method arguably constitutes a mathematical half-way house between the two, a compromise that causes theoretical or practical failure wherever it is applied. Recognition of Sign/house continues to depend upon the firm establishment of its theoretical basis (including its circumpolar procedure) and whether or not it is appropriate to use the method in conjunction with the Tropical Zodiac. Placidus is not, as is repeated ad nauseum, the only quadrant method that cannot be applied above latitudes 66½. On the contrary, it is the only one that can be used in the Polar Regions without sacrificing astronomical and/or astrological integrity. That it will not always yield twelve unambiguous Ecliptic cusps does not represent failure. Rather, the absence or doubling of cusps at higher latitudes is - as has been observed - an accurate reflection of the seasonal cycle, as experienced at that place. It is also an accurate reflection of what happens when astrological precepts developed in tropical and temperate regions of the world are applied near its Poles. Below: Yet another graphic depiction of the anti-clockwise motion of northerly circumpolar stars. This still was taken using time- lapse photography. Analysis of the term 'Horoskopos' (or '1st place') falls outside the scope of this series but the subject was touched upon in Polar Meridians and has subsequently drawn forth an intriguing suggestion from Dieter Koch. Readers are advised that what follows may make little sense to those unfamiliar with the relevant part of the previous paper. We saw that in temperate or tropical horoscopes, the Horoskopos is at all times created by the eastern horizon and is represented, unambiguously, by the rising degree. The Ascendant retains this exclusive role in the Polar Regions under Equal House and most quadrant methods. But once over the Polar Circles some parts of the Ecliptic cannot rise, so - as geographic latitude increases - fewer signs and degrees are available to the Ascendant/Horoskopos. At the Poles, only 0 Aries and 0 Libra occupy the horizon. A short distance away from the North Pole only Virgo and Libra can rise directly, followed by Aries and Pisces, which rise in reverse. As suggested previously, such a limited choice of Ascendants is arguably an appropriate expression of the region's restrictive nature, yet this is by no means certain. Likewise, the possibility of any qualitative difference between a direct and a reversing Ascendant must also remain, for now, a matter of conjecture. i) It is rising in the sky. ii) It is found on the eastern horizon. iii) In terms of the Ecliptic, it marks the beginning of the 1st house. In the Polar Regions, the structure of any method of domification other than Placidus assumes that the Horoskopos always occurs on, and is therefore synonymous with, the easterly horizon. Uncertainties regarding the Equal divisions aside, it also marks the 1st house in the Ecliptic. The second and third conditions, above, are thus fulfilled; but if there were indeed some qualitative difference between direct and reversing Ascendants, the latter would not necessarily fulfil the first condition. In Polar Meridians, we saw also that when the Ascendant is in reverse, the semi-arc system offers a source other than the horizon for determining the Horoskopos (or watcher of the hour). In the northern hemisphere, under Placidus, the lower part of the North/South Meridian forms one edge of the 1st house, so that any degree culminating below the southerly horizon is not an 'MC' but the leading edge of the 1st house. It was suggested that treating this degree as the principle 1st-house cusp (when the Ascendant is in reverse, only) would mean degrees that never rise remain available to the Horoskopos, even though they cannot form an Ascendant. An example of the practical application of this idea was given in the previous paper. This latter proposal assumes that the Horoskopos is at all times synonymous with the 1st house, which fulfils the third condition above. In so far as the Meridian is the product of (Earth's rotation of) the local horizon, this proposal arguably fulfils the second; but it does not fulfil the first condition. Any degree at upper culmination is at the apex of its trek across the sky and cannot therefore be associated with the idea of 'rising.' It is in fact commencing its descent. Polar Meridians suggested three alternative ways of determining the Horoskopos in a Placidian horoscope with a reversing Ascendant. This fourth option, along with the original option 2), also offers the solution to a question left unaddressed by the first part of this series. In The Polar Horoscope, we saw that at the exact latitudes of the Polar Circles, the local horizon and the Ecliptic can momentarily coincide, once a day, leaving no single Ascendant and no obvious planetary ruler. It is well-nigh impossible for this phenomenon to appear in a real horoscope, especially a nativity, requiring as it does split-second timing at an improbably exact location; but in theory such might occur. iv) Having provided the Horoskopos, the ascending degree passes thereafter into the 12th house. The principles underlying the semi-arc system provide the only means of transporting the quadrant horoscopy of the temperate and tropical zones to the Polar Circles and beyond. Such horoscopy includes primary directions, Gauquelin sectors, Planetary Hours and even the Pre-natal Epoch. No trigonometric division of an imaginary right sphere can ever serve this purpose. The difficult question is not then one of house division but whether it is genuinely appropriate to carry these ideas to places where the Sun does not rise once a day, every day. To this end it would be helpful if the essential meaning of 'Horoskopos' was firmly established. May cautious observation, study and experience provide the answers. 1 ] "Under the hood," in American-English. 2 ] Another example appeared earlier in this paper with the suggestion that Equal houses might replace some other method of domification when - and only when - the latter appears to present difficulties. This amounts to principle abandoned in favour of mathematical sleight-of-hand. Likewise the Koch system, which generates 12 Ecliptic cusps at relatively even (zodiacal) intervals, achieves this apparent balance with trigonometry that completely mangles (two segments of) the celestial sphere. Mathematics 'make a good servant but a very poor master,' and the importance of distinguishing between that which can be done and that which should be done cannot be over-emphasised. 3 ] These remarks apply also to Regiomontanus. Moreover under that system, it is even possible for a planet to enter some houses twice while also missing the 7th and 12th. At very high latitudes the 8th and 11th will also be missed. 4 ] It has also tended to alter astrologers' perception of what houses are. Campanus and Placidus are 3D constructions that have both arisen from 3D conceptions that do not lend themselves to accurate portrayal within a 2D Ecliptic-based chartwheel. This latter representation, which has risen to prominence in the West over the last 50-60 years, seems to have done even more damage to astrologers' perception of the houses. In such horoscopes, houses are necessarily reduced to two-dimensional radii and in the absence of clear and adequate direction to the contrary, that is exactly how they seem to be perceived. Why else would so many commentators suggest that some (Placidian or Campanian) houses are 'smaller' than others or that one (Ecliptic) quadrant is 'bigger' than another, when under both methods all houses and quadrants are always exactly the same size? How else could the much-vaunted and so-called "latitude problem" have arisen when, in the opinion of this writer, none exists? 5 ] It is all the more astonishing that the late Michel Gauquelin should have fallen into exactly the same trap, suggesting that the same treatment be accorded to his eponymous sectors. These sectors, like Placidus houses or Planetary Hours, are temporal sub-divisions of the oblique sphere that were conceived in order to address Gauquelin's temporal inquiries. Yet as Robert Powell reports, Gauquelin said he "was tempted to test (his) data with other house systems like Regiomontanus, Campanus, and Koch..." (History of the Houses, p. 25, footnote 1). This was doubtless a well-intentioned proposal, aimed at fair play, but it was both conceptually and spherically flawed. 6 ] This tendency is hardly confined to house division. Cascades of modern 'Arabic' lots (or Parts) involving outer planets etc., the geometric invention of unastronomical Ecliptic points (e.g. the 'co-Vertex' or 'co-Asc'), the Prime Vertical itself and 'latitude-corrected aspects' represent, if nothing else, even better examples of ideas dictated by that which is trigonometrically possible rather than that which is conceptually sound. These and similar ideas are all clear examples of the tail wagging the dog. 7 ] Here, the "day-for-a-year" temporal measure, evident to a greater or lesser degree in various methods of Primary and Secondary Directions, comes to mind. It would be incautious to conclude that the semi-arc system's temporal roots provide the link between day and year but neither can any possible connection be gainsaid. Further observations concerning this and directional methods fall beyond the scope of this series. 8 ] Or to quote Michael Edwards again; "Even the Zodiac we use is a kind of house system." Mike is arguably correct, though his assertion was a trigonometric observation, unconnected with any particular method of house division. 9 ] The semi-arc system provides for circumpolar Pre-Natal Epochs because parts of the North/South Meridians can provide edges of the 1st and 7th houses. Earlier writers (including Charles Jayne) have suggested ad hoc use of the Prime Vertical or Meridian in cases where the Moon tenants a degree that cannot rise or set. Substitution of the Meridian is exactly what would occur under Placidus; but without the arbitrary component. Many astrologers, past and present, have not been convinced that there is any truth in the Pre-natal Epoch, though its complete theory does not appear to have been handed down. But if residents of the temperate zones were to have such a thing as a PNE, so then must Inuit and those born in Murmansk, etc. Hand, R., (6/1999 & 8/1999), The oldest house system of all: Whole-sign houses, publ. The Mountain Astrologer. Leo, Alan., (1975) Casting the Horoscope, publ. L. N. Fowler & Co., London. North, J. D., (1986) Horoscopes and History, publ. The Warburg Institute, University of London. Powell, Robert, (1996), History of the Houses, publ. Astro Communications Service, San Diego, Ca. 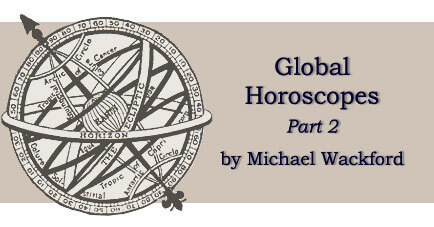 Mike Wackford's expert application of the horoscopy we know to polar regions should constitute required reading for all would-be horoscopists. To wit, Wackford's research shows that the extreme latitudes of polar regions offer the true test of the coherence of any theory of house division, thereby raising the question: what do we understand "horoscope" to mean? It comes from ancient Greek "horoskopos", or watcher of the hour who, like a Muslim Muezzin atop his minaret, today's Babylonian ziggurat, announced important time indices, such as sunrise, sunset, first glimpse of the New Moon, seasons etc. So "horoskopos" means he who identifies which degree of the zodiac is rising on the eastern horizon at any given moment, thus to orient ourselves and our doings in time. The word transferred itself from identifier to identified, so that in Greek latitudes horoskopos came to designate the whole sign rising on the eastern horizon at any given time, and thence the whole chart. Greek astrologers took this "horoskopos" as the first "topos" - or place - in its particular diurnal cycle. The other 11 signs constituted the remaining 11 places in order, much like Indian horoscopes. So why not avoid all strife by doing this in polar regions? Our author certainly suggests this as one answer. But firstly, not all signs can rise and set in polar regions, which questions the very basis of all our horoscopy. Secondly, if this is the best answer, why not use this simple method universally? The answer lies in the word 'time', a synonym for 'hour.' In Latin the word is 'tempus.' This is the very word used to designate an horoscopic chart in many old texts preserved in Arabic, then retranslated into medieval Latin. It clearly differentiates an astrological map from an astronomical map. Astronomy maps space, astrology maps time. An horoscopic figure is a clockface consisting of time measures ranging from one year, our zodiac, to one second accuracy of sidereal time to give us our meridian. Note how crucial is the role played by the Sun in most of these measures, and the Moon in more variable measures, while all seven planets lend their names to our days of the week. Most pertinently, as Wackford states, horoscopic timing marries annual revolution to diurnal rotation, even in the old Greek method. Interesting as it is to be reminded by this study that the tropics enjoy only two seasons, dry and wet, yet two midsummers; that without the obliquity of the ecliptic Earth would have no temperate zones, hence no astrologers; that the annual cycle of revolution at the Poles mimics a yearlong diurnal cycle, with a day season and a night season etc, the most valuable insight offered by this research concerns methods of domification. In every respect, the chief concern of horoscopy is to map 'tempus', time, from any particular place on Earth's surface. In casting our horoscope, we calculate the sidereal time of birth to establish the meridian which exactly halves the diurnal cycle into two equal arcs. From this we generate the "horoskopos", the degree of the zodiac rising that marks the horizon. In so doing we quarter the diurnal cycle into four semi-arcs that exactly replicate the unequal or planetary or canonical "hours" of light and darkness we experience on that particular day. Astrologers of yore used the mariner's astrolabe to do just that. Wackford's key point, so concisely demonstrated in his survey of how the various methods of domification perform in polar regions, is that the moment we calculate the meridian,(i) we engage with the semi-arc system of domification, favoured by Magini and Placidus (and by Ptolemy too, given his comments on prorogation - mw). So, after deriving the Ascendant, hence the actual semi-arcs, to then depart from the temporal sphere in order to trisect those semi-arcs by any other principle - most often derived from the right sphere - is grossly inconsistent and simply begs all righteous contumely heaped upon us by our critics. NB: our eyes see the sky as a flat screen, which Placidus acknowledges, unlike other systems whose procedures literalize the sphericity we do not see, at the price of the perfect astrological houring of the astrolabe, thus dumping us, as do other systems, back in the right sphere. On this point, how particularly ironic to find that Margaret Hone's Modern Textbook of Astrology, bible of the self-styled Faculty of Astrological Studies, only compounded the problem by advocating the astronomically misnamed Modus Aequalis, while recommending to students Ralph Holden's bewildering Elements of House Division, thus offering the usual selection of house systems almost as a choice between equals, as if "whatever works for you is ok." Yet Hone features on p.137, plain for all to see, the clear and unambiguous solution to the whole domification fiasco that Holden rehearses. Ludwig's masterful diagram clearly shows how Placidus precisely and elegantly reflects the way we see time in heavenly rotational motion! I have it from our author that his early mentor, Neil Gillings, (ii) was shown the diagram by Norman Blunsden, who reported that no-one understood it. Gillings did, but said nothing. Hone clearly did not, for she refers her reader to "the complexity of the discussion" that "it is not expected that he should understand..." She states categorically that "the idea held by many astrologers of a twelve-fold division of such houses...in anything like even sizes, as might be gathered from the customary chart form, is completely erroneous." It is her statement that is totally erroneous, for the houses equate in time and space, in perfect accord with the diurnal/nocturnal arcs, which in turn breathe in and out with the seasons. Placidus, we might add, was also a virtuoso musician who knew perfectly well how to sound the beauteous harmonies of the spheres of time. A further delicious irony for Anglo-Saxons everywhere lies in the fact that Ludwig's diagram was borrowed from just about the best astrological journal ever, Volguine's long-running "Les Cahiers Astrologiques." But that's French! And who, on this side of the Channel, would believe a Frenchman, especially one who had the bad grace to write his expose in French? 1) Its usual drawn form can fail from latitude 66N/S34' to each Pole, though partial salvation is offered by Placidus or by Sign/House. Thus, he concludes, our Ecliptic style of horoscopy is not global. 2) Placidus and Sign/House alone are truly valid modes of domification everywhere between the two Polar circles. So for those of us who would purge our Art of technical error he has at long last put our house(s) in order, no doubt to the discomfort of some, deservedly to the embarrassment of others. But why only partial salvation? Polar horoscopes suffer certain limitations particular to the territory e.g. some signs/degrees can never rise nor set; for six straight months of every year at the Poles, the Sun is the Light of Time, for the other six the Moon takes over; elsewhere in the polar regions, some signs rise backwards; the Ascendant daily conjoins the Meridian, upon the Polar Circles, and twice-daily within them etc. (iii) Drawing such horoscopes after the normal fashion often becomes impossible, though the Ludwig diagram properly depicts the astrological sky and provides an arguably superior format. And since all the signs of the zodiac can culminate and anticulminate, the northerly meridian may well provide a fallback position, if not the genuine solution. Some say that these Polar problems merely express the limitations of local natural conditions, though I have yet to see a decently reasoned astrological prophesy as to whether global warming might obviate such limitations and drive us all to seek refuge in newly clement regions. Nor can I believe that nomadic peoples native to at least the Northern Polar Regions of past and present have not a very intimate knowledge of their skies, as well as of skies to the south of the Polar Circle. Indeed, in 1997 I attended a lecture by the late Bruno Huber on an archaeological theory relating the Sumerian language, impressed in cuneiform on some 70 clay tablets of our earliest astrological text, Enuma Anu Enlil, to Turkish, Hungarian, Finnish and a language spoken by nomadic peoples of the Ural Mountains. Suppose it was such nomads - Scythians, as the Greeks called them, symbolised by an arrow - who brought with them their shamanic drums, skins covered with celestial imagery, as they extended their normal seasonal circuit for some unknown reason as far south as the fertile valleys of Mesopotamia and Sumer, where they settled, adapted and married their annual cycle to the months of the zodiac, and thus was born horoscopic astrology? Perhaps any native astrologers of those regions who might read this would kindly contact the editor and enlighten us all as to their mode of practice! Meanwhile, a very large THANK YOU to Mike Wackford! i ] Meridian means half a day. That is not space, it is time. In traditional terms too time is what Astrologia is all about. She tells us so herself: for the archetypal 10th that marks the archetypal meridian from top to bottom of the ecliptical chart is held by Capricorn, whose lord overlooks all, Old Father Time, Saturn in his diurnal sect dignity. ii ] By the author's own account, the first three articles in this series owe much to the guidance of the late Neil Gillings, a master little known even to his revered contemporaries whose names grace tomes he might well have styled, in the words of that great Ptolemist John Worsdale, "wretched compendia of borrowed and stolen trash." Not a few such names rightly pack the pages of "Recent Advances..."
iii ] The astronomical programme Starry Nights, now included in some astrological packages, is highly recommended to readers who wish to see for themselves, from any point on planet earth, or indeed in the Solar System, at any time and date, how the sky looks and behaves. Most illuminating! Caution: do bear in mind that what you will see is sidereal. To convert to tropical positions add 23.5-25 degrees over the period 1900-2018. © Michael Wackford. Published online June 2008. This article was published in Correlation 23 (1) 2005; pp.45-63.